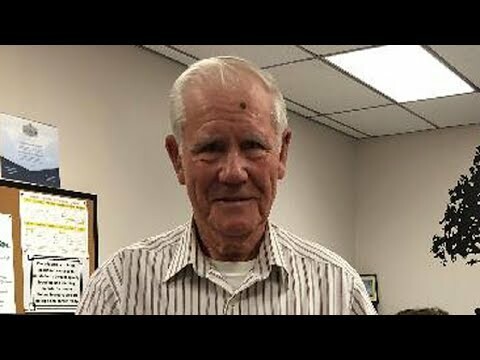 8-year-old returns $100 to 86-year-old man who lost it. An 8-year-old boy in Louisiana already knows the importance of integrity. Jaron Johnson was walking in a Walmart store in Pineville when he spotted a $100 bill on the floor. “He was a few steps behind me and said, ‘Mom, look what I have in my pocket,’ and he said, ‘Can we turn it in to Walmart and give it to the rightful owner?’ Jodie Johnson, Jaron’s mom, told InsideEdition.com. But she was proud of her son for wanting to do the right thing. “The next morning, as soon as we woke up, he asked if I called Walmart, so we called Walmart and said has anyone called in reporting that they lost something,” said Johnson. Johnson said she didn’t mention what it was but gave employees her number just in case someone called. Later that day, she received a call from 86-year-old James Grice’s daughter. Her father had lost the bill while he was shopping and hadn’t had enough money to pay for his groceries that day. The pair met last week and Johnson said it made her grateful that Grice was so appreciative. He lives on a fixed income so a lost $100 makes a major difference. To reward Jaron, Grice gave the 8-year-old $20.